Before we had children, I rarely had time to clip a coupon, much less remember to take them along to the store and match them up with the right items. Now that we've been minus that extra paycheck for six and a half years, coupons have become something that I strive to conquer at the grocery store. Many times our grocery bill totals at 50-60% off! Those days, I love coupons! I usually only clip the ones that I would consider using, so obviously I don't waste time clipping coupons for denture cream or adult diapers...I'm just saying... I also hunt down good coupons online! Coupons.com has a lot of great coupons and new ones are loaded every month. The next step is find a good *free* website that will give you a heads-up on coupon match-ups at area stores. Please do not spend money to have someone tell you about these deals! Housewife Hacks is done by a local gal who always posts great deals! I love that she does the work of sifting through the weekly ads for deals and coupon match-ups! She also posts the links to find the online coupons--can't get easier than that! There are several other great websites...just follow the links! I'll try to get the ones I use listed my my sidebar soon! 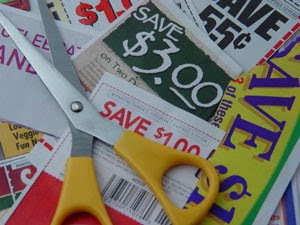 My final word of advice today concerning coupons is don't buy an item just because you have a coupon! Those silly 25 cent off coupons for Charmin toilet paper do not make it justifiable for me to buy it over another cheaper brand. Now, if you're a die hard fan of a certain brand and will only buy that certain brand, then by all means, coupon away! Hope these thrifty coupon tips help! Also a big fan of coupons! Bring 'em on and get me some scissors!